Tobias Patrick Wolf FRSA is an award-winning German conductor and composer, educator and performer based in Aberdeen, Scotland and Bonn, Germany. As Music Director of The King’s Philharmonic Wind Orchestra and other ensembles, he brings with his explosive energy the challenging repertoire to be performed at the very highest level — in the United Kingdom, the European mainland, and around the world. Horror! A musical celebration of nightmares and monsters! Music is for everyone! Regardless of your background, your age, or your musical experience – let me help you to enjoy a different side of music making in your very own way. Or maybe you are looking for opportunities to develop your skills in conducting, composition or performance? Check this out. Join a community choir or apply for membership in an orchestra! We are very lucky to have a wide range of ensembles within the un poco network. Whether you are interested in joining a community choir, sing in a more advanced choir, or apply for a seat in a full size orchestra: there will be something for you! It is never to late to start lerning an instrument! Why not give it a try? Many people regret not having learned an instrument, but there has never been anyone who has regretted engaging in music. In more than 10 years as instrumental and music tutor I have helped numerous musicians on their journey of becoming more proficient players. Be one of them! Compose for wind orchestra or apply for a conducting scholarship! The Orchestras within the un poco network are dedicated to providing young composers with the opportunity to write for a large wind ensemble, and to frequently work with emerging conductors and solo artists. Get in touch or apply for a scholarship with us. Reflection on plastic artworks of Shinkichi Tajiri for two trumpet players and one pianist. 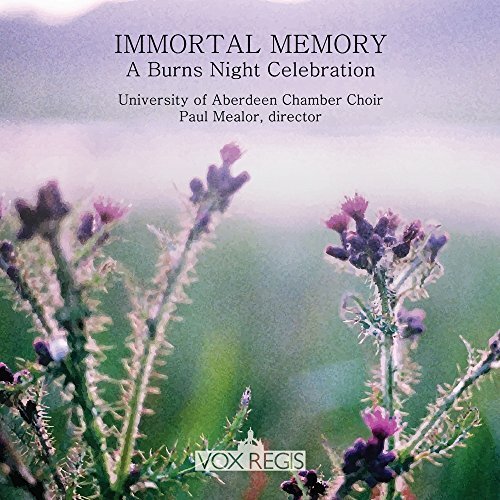 Under the direction of Paul Mealor, the University of Aberdeen Chamber Choir performs fresh new arrangements of songs by Burns made by the University’s staff and students, along with guest contributions from Robert Lovie, Jillian Bain Christie and fiddler Raemond Jappy. Celebrate Burns night in style! The CD is for sale on both Amazon and iTunes, and all proceeds from the Sale of Immortal Memory: A Burns Night Celebration go to the relief efforts in Ballater, Scotland, which was recently devastated by flooding.